It sounds to me like Democritus would have gotten along well with soap makers—though we would have convinced him that honey was good to use on the inside and the outside. Madame du Barry, the infamous last mistress of Louis XV, used honey as a form of ​a facial mask, lying down for a rest while the honey did its work. It was said that Queen Anne of England used a honey and oil concoction to keep her long hair lustrous, thick and shiny. It was claimed that another famous Englishwoman, Sarah, Duchess of Marlborough, used her own secret recipe for honey water to keep her hair beautiful. But history aside, honey is actually a pretty remarkable liquid. Honey is primarily known for its humectant and antimicrobial qualities. (A humectant is a compound that attracts moisture to itself and helps retain the moisture.) Naturally, humectants are wonderful oil additives to lotions, scrubs, and other skin care products. Honey's unique chemical composition also makes it an effective antimicrobial agent. People have used it to treat minor burns and scrapes, and for aiding the treatment of sore throats and other bacterial infections for centuries. And if you just want to use it in some tea or on a muffin, honey contains antioxidants, trace amounts of vitamins, so it’s better for you than just plain sugar. 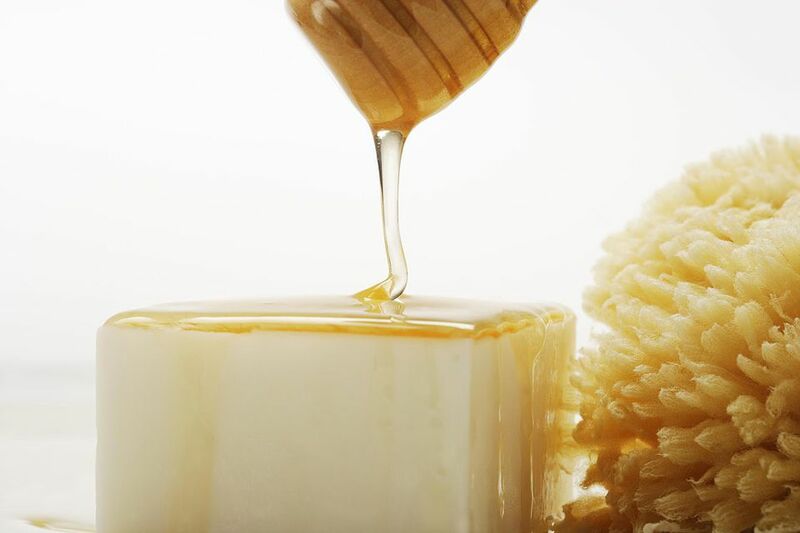 Honey is also a wonderful additive to soaps, and you don't have to be a beekeeper to use it. It imparts a light, warm, sweet scent, the added sugar content helps increase the lather, and acts as a humectant. We generally use about 1 tbs. per pound of oils and add it at a very light trace. You want to make sure it gets completely incorporated into the soap before your trace gets too thick. Honey will turn your soap a light tan color. This, similar to what occurs when you use milk in soap, is from the chemical reaction with the extra sugars in the soap. There are also melt and pour bases with honey in them like honey melt and pour base.